Living in a hot country like Singapore might be a The average cost of an air-conditioning service is $350. You are likely to spend between $80 - 2,000 exact prices may vary depending on the are and project details. All of us would hire a professional to do the Aircon Installation. Aircon Installation never become an easy task. 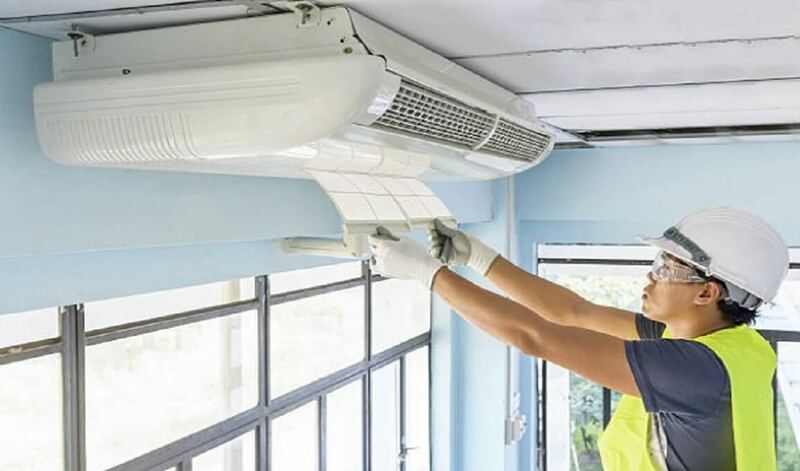 But it would be good if you familiarise yourself with the commonly used term so you have a better understanding when you talk to the aircon technician before the aircon installation to your place. These are the commonly used terms that you should be familiarised during the installation of aircon. This is somehow yourAircon Installation Guide. BTU represents the cooling capacity of the aircon, the higher BTU the higher cooling capacity. The cooling capacity usually expressed as Kilowatt (KW) or Horsepower (HP). 1 kW is about 3412BTU. 1HP is about 9000BTU. Why is BTU important to the selection of aircon for installation? BTU is associated with the Fan Coil Unit. A bigger room needs a higher BTU Fan Coil and conversely, a smaller room needs a smaller cooling capacity Fan Coil. So what is the right BTU for HDB or Condo? The Fan Coil Unit BTU usually comes in 9,000BTU (2.5 kW or 1HP), 12,000BTU (3.5kW or 1.5 HP), 18,000BTU (5kW or 2HP) and 24,000BTU (7kW or 2.5 HP). A normal size HDB bedroom or condo bedroom only requires a BTU or cooling capacity of 9,000BTU. If it is a larger room like the master bedroom, a 12,000BTU should be sufficient enough. 18,000BTU and 24,000BTU Fan Coil are usually used for larger areas like the living room or area where rapid cooling is required. For a split type aircon system, the Compressor Unit is located outside for better insulation of heat. The correct matching is important so that the Compressor and Condenser Unit is sufficiently powered. You can base the number of FCU unit that you can install on the compressor load capacity. For example, your compressor can handle 28,000 BTU, you can definitely install 3 Fan Coil Unit with 9,000 BTU. If you di the math that is 9,000 x 3 = 27,000. The compressor is 28,000 so 27,000 can definitely handle by your compressor. What is the difference between Inverter vs Non-inverter? Another common issue you would face is whether you should buy an inverter aircon. An inverter type aircon is made up of variable speed compressor. The main purpose of this one is not to allow the compressor to run at full speed all the time but it controls the operation when needed. The inverter air conditioner is quieter in its operation. It cruises along maintaining and adjusting the temperature constantly. This also means that their wear and tear is less making them last longer. Non-inverter Aircon is one of the common types of aircon unit in the market. This is a model that can be operated by switching on and off for the temperature control. The compressor motor controls the compressors as needed. A constant amount of energy is sent to the compressor which it helps to run it on a constant speed. The non-inverter model usually turns on and off any time they reach a certain temperature considered to be their limit. The system is made to work hard which produces a lot of noise. These air conditioners are significantly less costly compared to inverter air conditioner unit. There are types of refrigerant – R22 and R410A. Most of the new aircon in the marketing are using R410A refrigerant. These are the reasons why you should look for aircon / compressor using R410A refrigerant. 1) R22 refrigerant will be phasing out soon. Therefore its supplies and parts will become limited and become more expensive in the future. 2) R410A is an Ozone Friendly refrigerant. 4) The mechanism of aircon with R410A refrigerant is more heavy duty and quieter as compared to R22 refrigerant. In additional to selecting the aircon system, the aircon professional who is installing your aircon system must also be reliable. Just like a good car needs a good driver, a good aircon system needs a good installer to achieve the best result.